Famed American photographer and environmentalist Ansel Adams said it best when he shared this photography tip: “Bad weather makes for good photography.” If there’s one photo genre we always find ourselves gravitating towards, it’s nature photography, and we’re confident that many of you would agree based on the number of nature shots shared on Instagram each day. The Weather Channel understands consumers’ fascination with both nature and the weather, and taps into its underlying affinity network of photographers. While most of us run for cover during bad weather, these loyalists hustle outdoors to capture the perfect shot. The fourth annual “It’s Amazing Out There” photo contest, running through August 7, 2017, is a testament to that enthusiasm, and with a DCI score of 302, it’s clear that the Weather Channel team learned some valuable tips on how to execute a picture-perfect digital campaign. The Weather Channel’s “It’s Amazing Out There” photo contest is performing extremely well to date, with a DCI Score of 302, comprised of an Engagement Score (ES) of 321 and a Virality Score (VS) of 289. This is the fourth year that the Weather Channel built and is running its photo contest on the Wyng platform. The campaign has such a high DCI Score partly due to the fact that they’ve applied learnings from previous years, such as streamlining the submission process and adding multiple photo galleries to maximize engagement, but it’s worth noting that the Weather Channel is seeing atypically high results. Most DCI Scores fall somewhere in the 0-200 range. The Weather Channel team implemented a two-step campaign to ensure high engagement and virality. Phase 1 encourages consumers to submit photos, whereas Phase 2 launches a fan faves voting competition to keep consumers engaged and sharing long after the initial submission period is closed. Check out more details on their mid-campaign Engagement Score (ES) and Virality Score (VS) below. Take advantage of improved components: The recently-updated Wyng Form component streamlines the submission process and makes it even easier for consumers to participate, resulting in an increase in content entries. 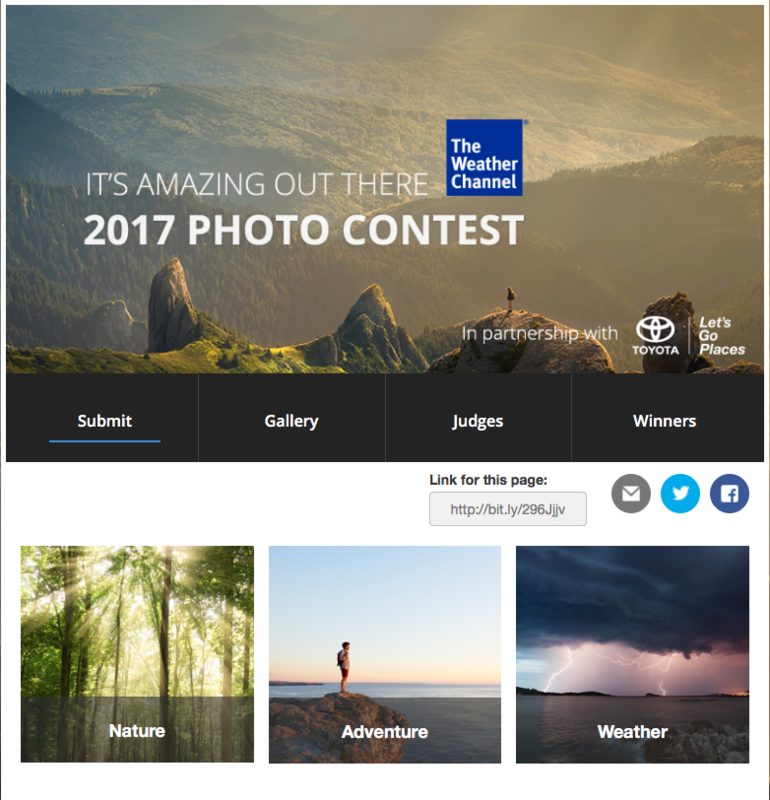 Incorporate previous years’ submissions: Not only is the Weather Channel featuring current submissions, but they also link to 2016 winners, keeping consumers on their pages, scrolling through and clicking on eye-catching photos. Add a voting component: Adding a voting component encourages consumers to come to check on when voting opens, and once it does open it will likely boost their engagement score even further when consumers come back to vote on their favorite photo and check their voting status. Drive sharing via voting: Although the Weather Channel has a panel of judges who will determine the ultimate winner, they added fan favorite component to the campaign, increasing the number of people sharing their individual photos to solicit votes and drive earned visits. Enable multiple options for sharing: Campaign participants and viewers can share their favorite entries in one of multiple ways, including Pinterest, Twitter, Facebook and via email, facilitating the share process with family and friends and driving earned reach. Allowing one vote per day: Many campaigns limit consumers to vote once throughout the duration of the campaign, but the Weather Channel realized that allowing one vote per consumer, per day, would not only drive repeat traffic, but also repeat content and campaign-level sharing. Not only did the Weather Channel capitalize on learnings from previous campaigns to optimize their Engagement (ES) and Virality (VS) Scores to drive a high DCI, but they also learned how to more effectively allocate media spend for this year’s competition, which can be tracked in the Wyng platform. To learn more about the Weather Channel’s 2017 “It’s Amazing Out There” photo contest and the $15,000 grand prize, visit the campaign here. Learn more about the Wyng Digital Campaign Index here.